‘Tis the season of carol singing, tree decorating, gift giving, and Christmas spirit! But did you know Santa is not the only “Klaas” coming to town? Our Dutch neighbors in the Netherlands celebrate the holiday spirit a little differently than we do here in the States. While he may look a bit like Santa Claus, Sinterklaas is a loved Dutch character, celebrated by children and adults through an annual parade in Amsterdam. The parade is followed by a tradition of gift giving and holiday cheer! The legend goes all the way back to 343 AD. Sinterklaas, also known as Saint Nicholas, originated from Turkey but had close ties to the Netherlands. He was an honorable man who brought joy to the children of Amsterdam. He comes each year in mid-November to begin a series of traditional festivities. Traveling by boat from Spain with his band of merry helpers, the Zwarte Pieten, Sinterklass makes his official entry into the Netherlands. He then trades his boat for a grand white horse and rides into town wearing traditional Bishop’s robes. Accompanied by his helpers, he hands out candy and cookies to thousands of onlookers during his journey through Amsterdam. Amsterdam hosts the largest Sinterklaas parade in the world. Followed by more and a kilometer of floats, boats, and 600 Zwarte Pieten, Saint Nicholas sails into town November 16th. Over 400,000 spectators line the canals to welcome him and his crew of helpers. Once on his horse, Sinterklaas continues the parade throughout the city until his arrival in Dam Square, where a musical festival for children begins. Once the musical portion of his trip comes to a close, the parade continues through the city until his last stop in Liedseplein. Once there, Sinterklaas delivers a message from the balcony of the Stadsschouwburg to the onlookers below. 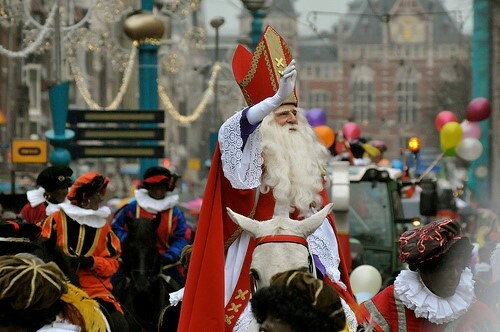 Parades and festivities are not the only joy Sinterklaas brings to the Netherlands. Once he is in town, the children lay their shoes out before bedtime hoping a gift will be left in them by the morning. Similar to the tradition of Santa Clause, good children receive treats while naughty children nervously wait to see if they receive coal. 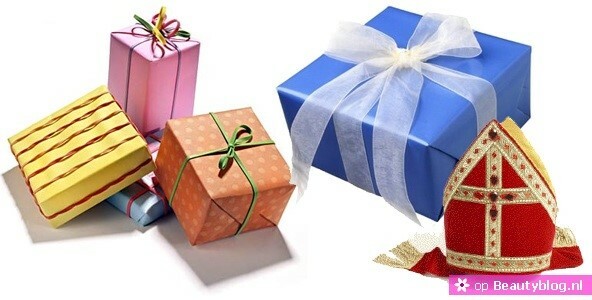 The main gift giving occasion occurs on December 5th, a day named sinterklaasavond (Sinterklaas evening) or pakjesavond (presents evening). Sinterklaas is sure to leave presents on doorsteps before making his way back to Spain. Much like Christmas, the next day is spent opening gifts, singing songs, and ending the day with a feast. So next time Sinterklaas is in town, leave your shoes out before bed and maybe you too will wake up to a little gift left by the good ole’ Saint Nicholas.